The Pr.1124 (1940) is a rank II Soviet armoured gun boat with a battle rating of 2.0 (AB/RB/SB). It was introduced during Update 1.79 "Project X" when the Soviet fleet was implemented into the game. The Pr.1124 is equipped with two 76mm T-34 turrets, essentially using the same guns as used on the T-34 tank. 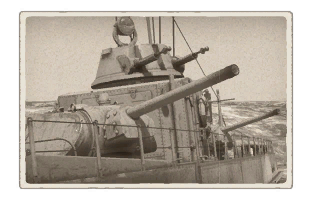 These guns are fairly large for this BR, but they require a different strategy than a typical torpedo boat owing to it having a decent reload time. You cannot just spray bullets with this ship; you must aim for certain modules with a greater precision than if you could just use a machine gun. When a good hit occurs, it usually causes a considerable amount of damage for the opposing ship, and may even cause hull breaks against smaller ships. HE is the recommended ammo for this gun as most ships at this BR have low to no armor and are vulnerable to explosives. 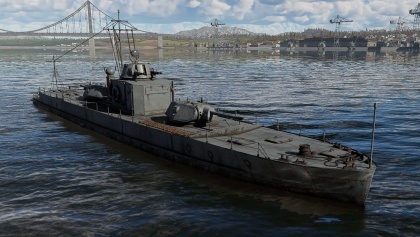 With two standard-issue 12.7 mm DShK machine guns as its only armaments supplementing the 76 mm turrets, the Pr.1124 (1940) is vulnerable to savvy torpedo boats and other nimble opponents, particularly at close range. Hitting fast-moving targets with the 76mm guns can be a significant challenge, and the long reload times compared to lower-caliber automatic weapons give only a handful of opportunities for aim adjustment. As these machine guns pull double-duty as AAA they're also often unavailable for naval targeting. Proceed accordingly, being cautious to avoid engaging enemies who fall into this ship's mid-range weaponry blind spot. You've got fantastic long-range firepower at a very low BR, but limited defense against fast and evasive enemies + air power. Accordingly, the Pr.1124 (1940) should fight conservatively at at the longest possible range your gunnery skill affords. At this BR, very few opponents will have large-caliber guns that can play ball at range, and even fewer players will be able to target them effectively, so use that to your advantage. Also note that repair costs for such a low BR vehicle are very high, which is another reason to avoid charging into the fray. The ship is lightly-armoured but not nearly well enough to be able to take much of a beating.